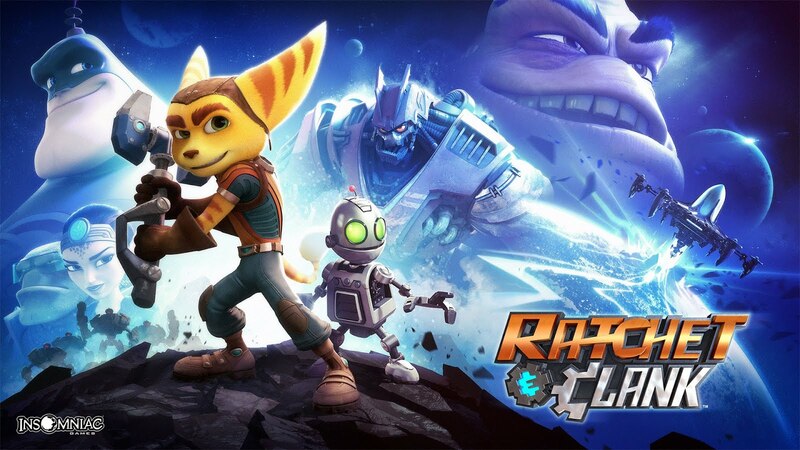 Pablo Gunner talks about and reviews Ratchet & Clank for PS4. First off I feel like I have to come clean by saying that I unfortunately never played Ratchet & Clank back in the day. Now that we got over that hump lets get into this. It starts with a criminal arriving at prison. Then an inmate, Captain Quark, does a retelling of the Ratchet & Clank story to his new fellow inmate. Captain Quark narrates throughout the game, hilariously and superbly so. There's a nice little tutorial. I always appreciate games that have nice, short, and basic tutorials. If you're like me and you've never played a Ratchet & Clank game, it's about furry, raccoon looking, gear-head, alien fella, they call a lombax, who wants to be a galactic police officer but he has a checkered past, and his defective robot buddy, that escaped his evil creator to warn the galactic rangers of an imminent attack, that he fixes up. Together they join forces to stop an evil corporation and super evil scientist from taking over and destroying the universe. It's a story about friends, achieving your dreams, defying the odds, and stopping evil, all while having a blast doing it. The story had twists and turns, some a little more obvious than others. The story was great. A good story is great but a good story with great gameplay is super. You start off with a basic melee weapon you can also throw like a boomerang. Soon you attain bombs and a gun. Throughout the game you gain various weapons, the craziest are a disco ball that distracts enemies, a gun that turns enemies into sheep, and another that changes them to pixels. You can upgrade your weapons based on usage and purchasing. Each world you go to looks different, has different enemies, objectives, optional tasks, and secret hidden goodies. The boss fights are epic especially the final boss which was really challenging. The visuals looked so crisp and amazing which can practically be said with any current gen game so it should go without saying but nonetheless. Overall this game just made me feel all warm and fuzzy inside. It took me back to those classic PS2 games of yesteryear. It's the first time in a long time I've felt this way and the first time in a long time that I did an all day all night binger playing a game because I just didn't want to stop. This game had everything I could ever want in a game. My only complaint is that Clank was underutilized in gameplay, character, and lines/vocals. Apart from that I have no complaints only high praise. This is a game that's deep enough for adults but also fit for kids. It has that Toy Story feel to it. I must mention that it wasn't a very long game but it does have replay value. With my grade scale of STRONG BUY, BUY, weak BUY, STRONG Rent, Rent, weak Rent, and pass, I give it a BUY.